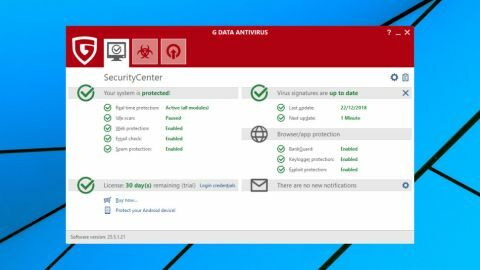 G Data offers strong antivirus and web protection, but this package is overpriced and may slow your PC down. Most big-name antivirus companies like to boast about their years of experience, but few can match G Data in this respect. Not only has the German developer been around for more than 30 years, it also claims to have developed the first antivirus program way back in 1985. Fast forward to today and G Data has highly-rated consumer security products for Windows, Android and Mac, as well as some very comprehensive endpoint solutions for businesses. The range starts with G Data Antivirus which we are reviewing here. Despite being the baseline product, it goes beyond the usual PC antivirus fundamentals, with exploit protection, anti-ransomware, URL filtering, a spam filter, and specialist browser hardening to help secure online banking and shopping. The program uses multiple technologies to keep you safe, including its own engine, the Bitdefender engine, and a CYREN-based layer to better detect outbreaks as they happen. Single device licenses are top of the normal range at £30 ($39) for a year. Top packages like Bitdefender Antivirus Plus are the same price, but many come in cheaper, and for example Kaspersky Anti-Virus costs £25 ($32.50) to cover one device for a year. There are savings available if you're adding computers or extending the license term, so for example a five PC, two-year license costs only £95 ($123.50). But other vendors do much the same, and covering those devices with Kaspersky Anti-Virus would cost just £80 ($104). A free trial is available, and there's the added security of a 30-day money-back guarantee if you run into problems. The G Data Antivirus trial was simple to find and download. The installer took a while to download the setup components it needs, but after that everything ran smoothly, with no hassles or complications. As with many competitors, G Data asks you to register the program by providing your name and email address. The installer also asks for your physical address and phone number, but providing them is optional, and we were able to leave those boxes blank. Moments after the main setup process was complete, a pop-up window recommended we install G Data WebProtection, a Chrome extension which prevents you accessing phishing, scam and malicious sites. We would much prefer this to be handled at the network level to ensure it covers all browsers and applications, but G Data claims this improves accuracy (we're unsure how). Rebooting, we found G Data had added 600MB of code to our hard drive and no less than seven new background processes. They typically consumed a minimal 250MB, but when our system was under load, it did seem to be noticeably slower than usual. We didn't try to come up with an objective measurement of G Data's performance impact, but someone else has, and we'll talk more about that later. The opening screen doesn't sum up your security status with a big ‘Protected’ caption or a reassuring green tick, for instance. It shows the status of all seven protection layers, along with update details, license information and system messages. These status reports also act as menus. A line reading 'Web Protection: Enabled' isn't just plain text, for example. Clicking Web Protection displays a menu with options to disable URL filtering, add exceptions, or open the Settings dialog for more tweaks. Similarly, clicking status lines for Real Time Protection, Spam Protection and the other layers also gives you speedy access to common settings. It's a smart idea which makes good use of screen space and ensures it's easy to find what you need. A Virus Protection tab includes more links to run various types of scan: quick, full, check specific files or folders, removable drives, or scan for rootkits. Scans were a little faster than average, and accurate, detecting every sample we tried. Unlike the last time we reviewed G Data, they didn't raise a single false alarm. We spotted a small issue with G Data's inability to run two scans simultaneously. If the program is running a lengthy system scan, for instance, trying to scan your last download from Explorer's right-click menu will just produce a 'can't do that, a scan is already running' message. Elsewhere, the URL filter generally worked well, blocking almost all our web threat URLs. We're still unclear why G Data recommends installing its browser extensions, though. Maybe they result in more detections, but our Chrome add-on had no configuration options and didn't appear to add anything useful. The spam filter was a surprise, integrating neatly with our Outlook installation (though it also works elsewhere), and providing a bunch of configuration options. We didn't run an in-depth test, but from our small sample, the module easily outperformed Outlook's default Junk filter, and got close to commercial anti-spam levels of accuracy. Some G Data Antivirus components are difficult to test. The BankGuard and exploit protection harden vulnerable processes via work done deep inside the engine, and there's no way to sensibly evaluate them in this review. We did manage to check out the Keylogger Protection module. By default, this only protects a small number of applications – mostly just common browsers – but we tried it with a commercial keylogger and it wasn't able to see anything we entered online. You can extend this protection to other apps, but G Data warns that some programs are 'incompatible' with the technology and it may not work for everyone. The only other bonus tool is Autostart Manager, an easy way to optimize your PC by delaying the launch of some Windows startup programs. If you're tired of the Steam client grabbing resources every time your system boots, for instance, you can delay its start for two minutes (or three, or more). Less competition at boot time means your PC is usable more quickly, although of course your delayed programs still run eventually. This can be a useful feature, although there's excellent freeware which does the same and more. We run some malware tests during antivirus reviews, but the major testing labs do many more and over a longer period, so it's important to check their reports to get the big picture. AV Comparatives hasn't tested G Data products for a few years now, but AV-Test includes them in most reports, usually with positive results. Its September/October 2018 Best Antivirus Software for Windows Home User report found the program protected against 100% of widespread malware, and very close to 100% of zero-day attacks, earning it the maximum protection score. The report also found much more performance impact than usual, though, reducing G Data's overall score. We tried to look deeper into the question marks over performance by checking PassMark's Consumer Security Products Performance Benchmarks 2019 (Edition 2). This report assessed 14 security suites with 23 metrics for their impact on performance, and G Data was way down the field in 9th place (only Avast/AVG, a couple of Trend Micro products and Bitdefender Internet Security were lower). Low scores like this are a disappointment, but it's important to keep them in perspective. G Data did well in some of PassMark's metrics, the differences between the packages are often marginal, and protection is more important than speed, anyway. If you're concerned, check PassMark's report and read the details. We would like to have completed the review by pitting G Data Antivirus against our custom ransomware simulator, to see if it could detect and block ransomware from behavior alone. But unfortunately for us, this wasn't possible, as the program blocked the file before we could run it. We can't comment on G Data's behavior monitoring abilities, then, but it scored well for static file detection and did a good job of keeping us safe. G Data Antivirus is an accurate and reliable malware blocker, and useful bonus features like the capable spam filter lift it above the plain antivirus-only competition. There is some performance impact and it might slow you down, but overall the product is definitely worth a try.